Quick – What did you have for dinner last night? If you are like most people, uncovering that answer in your brain probably took some time. Multi-tasking has gone main stream and has blunted the overall awareness of our most fundamental activities. If you are looking to get a handle on the distractions in your life, then your nutritional health will stand to benefit. ‘Distracted Dining’ can be simply defined as diverting focus from your dietary intake. The source of distraction can take many forms. It is a challenge for an individual to eat healthfully if they are not focused on the task at hand. After all, if a person is not fully aware of what they are doing – then how can they be sure if they are doing it right? Recent research has measured how food intake is impacted when the brain is concentrating on something else besides a fork and spoon. Researchers in Great Britain looked at how playing a computer card game during a meal influenced a person’s eating behavior. The test subjects were given a prepared lunch and then 30 minutes later were questioned about the meal and were also offered a “taste test” snack. The study showed that the distracted eaters ate twice as much during the subsequent taste test in comparison to those without the diversion. 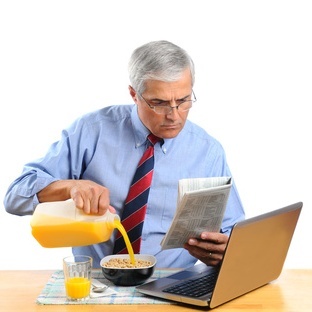 The individuals who were playing the computer card game also reported being less satisfied with their lunch meals and also had difficulty remembering what they just ate. Another common trap for distracted diners is the tendency to eat food at a rapid rate. By doing so, the enjoyment of the meal is lessened while caloric intake is heightened. “It takes a while for our brain to actually compute satiety. When we are shoveling the food in we tend to take in more calories than we would have if we slowed down and were mindful about our eating. Let your body respond to the food and increase satiety,” states Jill McCann, a Registered Dietitian with Preferred Nutrition Services. It takes about 20 minutes for food to be digested enough to influence hormones and impact blood sugar so savoring the meal and enjoying each bite helps on multiple levels. Becoming fully engaged in what you are doing sounds more like a life lesson, than nutritional advice, but it is important nonetheless. The concept of ‘mindless eating’ is fairly new, but it has become part of America’s nutritional lexicon. McCann coaches clients on techniques to fight mindless eating. “Distracted dining is one of the biggest driving forces against anyone seeking weight management or overall wellness,” states McCann. McCann uses the acronym H.A.L.T. to help her clients curtail their tendencies towards mindless eating. “H.A.L.T. stands for Hungry, Angry, Lonely or Tired,” states McCann. “Before taking that first bite, you should HALT and ask yourself if you are actually hungry or if you responding to other emotions.” It is quite normal for feelings of hunger to be present anywhere from 4 to 5 hours after eating. Anything inside of that window would require taking an emotional inventory. Stressful situations, like those that trigger feelings of anger, can lead many people towards food. “I see emotional hunger a lot of times in the afternoon or nighttime as people are stressed out when they get home from work,” states McCann. “Food becomes a comfort for them.” In those circumstances McCann suggests simple deep breathing techniques before even opening the kitchen pantry. Loneliness is another emotion that can influence a person’s attraction towards food. The act of eating increases serotonin levels in the brain which can elevate mood and provide a distraction from feelings such as isolation. Visiting with friends or family is the more healthful way to address this emotion. The consensus among nutritional therapists is that the emotions we may experience are controlled by outside forces, but how a person responds to that emotion is completely under their control. “Being healthy involves standing up for yourself and having confidence in the choices you are making,” states Clifton. Fatigue is the last feeling in the H.A.L.T. tool and it is a common foe in weight loss efforts. The relationship between weariness and weight gain are driven by the two hormones that regulate hunger: gherlin and leptin. Gherlin is a hormone made in the stomach that tells the brain when it is time to eat. Conversely, leptin is the hormone that sends a signal to the brain that you are full. Leptin is released by the fat cells in our body. 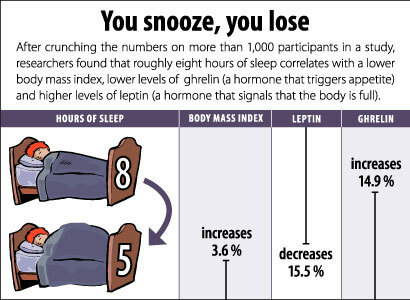 Researchers have found that people who regularly get less than seven hours of sleep have higher levels of gherlin and lower levels of leptin. It is easy to see why this hormonal one-two punch can lead to weight gain. One common technique for battling the struggles of mindless eaters is food journaling. Clifton uses it as a tool with many of the clients in her wellness programs. “The journaling allows them to know where they stand with every single thing that they eat,” states Clifton. The method used to journal, whether online or hand-written, depends on the needs of the individual but either method creates much needed awareness. The cell phone, which is a weapon of mass distraction in most cases, can actually be a valuable ally for tracking intake. Clifton recommends fitday.com and myfitnesspal.com since they have meal tracking applications that are compatible with most smart phones. These websites help the user identify specific calorie goals and have a wealth of food items stored in their databases. “Sparkpeople.com is another good resource since it has a social media component which can be a source of additional motivation by being part of a community,” states Clifton. Best of all, they are free. Your bank account will appreciate that mindfulness. At the end of the day Disturbances during meals are sometimes inevitable. The fact that your senses may be pulled in different directions while you eat does not mean it is unhealthy. However, if the television, desk or steering wheel is frequently at arm’s length during meals it may be time for a change of scenery. Maybe by this time tomorrow you will remember what you had for dinner. The link between ADHD and poor eating habits isn’t surprising when you consider that it is a disorder of executive function, a set of cognitive skills which act as our brain manager. Executive function impacts almost every aspect of living, encompassing our ability to self-regulate, organize, plan, prioritize, and anticipate the future. Eating is only one of many facets of ordinary life influenced by ADHD, yet typically flies under the radar. 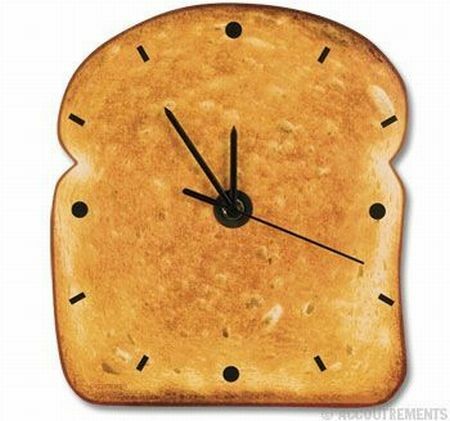 What Time Should I Stop Eating? Optimal health and effective weight loss require eating small, smart portions throughout the day, and even into the evening.